Micromax has updated it’s Canvas Juice series of smartphones with the new Micromax Canvas Juice 3 and Juice 3+ smartphones. The Canvas Juice 3 and Juice 3+ are the upgraded variant of Canvas Juice 2 that was launched earlier this year. While the Juice 3 is already on sale for Rs.8,999; the juice 3+ will be in-stock before the end of this month. Vineet Taneja, CEO, Micromax said, “At Micromax, we have always been committed to address today’s smartphone users’ biggest need of long lasting batteries. With the introduction of two new smartphones in our Canvas Juice series, we aim to create a perfect value proposition enabling our highly mobile consumers to make the most of these heavy duty marathon batteries for work and entertainment requirements”. The Juice 3 comes with a model number Q392 and is available in Silver color only. The 4,000mAh battery on both the devices will be the main USP, but will also offer one of the loudest speakers on smartphones with 96 decibels. The only difference between both devices is the display; the Juice 3 comes with a 5-inch HD (1280×720) display, and the Juice 3+ has a larger 5.5-inch HD (1280×720) display. Both the devices sport Gorilla Glass 3 protection. It is powered by 1.3GHz MediaTek MT6580 quad-core processor with 2GB of RAM. There is an 8GB of internal storage along with a microSD card slot for expanding up to 32GB. On the camera front, the devices have an 8MP rear camera with LED flash and a 2MP front camera for selfies and video calls. The devices support dual SIM dual standby but lacks the 4G LTE connectivity that is normally found in the device priced around Rs.10,000. The 4,000mAh battery on the Canvas Juice 3 is said to offer 14 hours of talk time and lasts upto 514 hours on standby. The Juice 3 and Juice 3+ runs on Android 5.0 Lollipop out-of-the-box. Though there is no 4G LTE connectivity, the devices come with Wi-Fi, 3G, Wi-Fi Hotspot, Bluetooth 4.0, GPS/A-GPS, and MicroUSB 2.0. 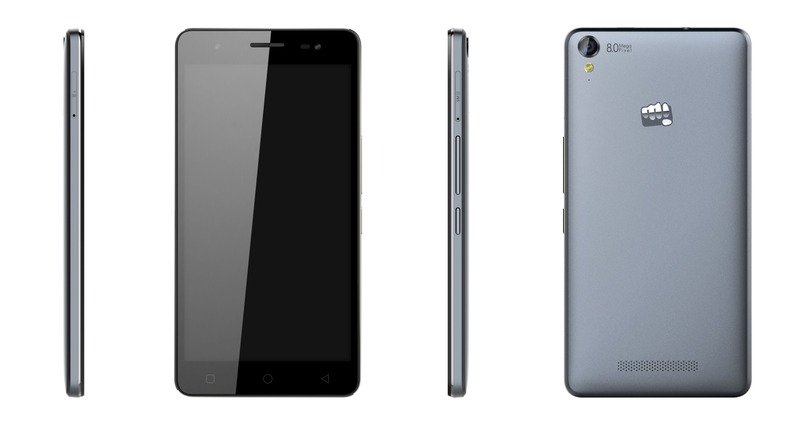 Recently the company has also announced that their first Helio X10 powered smartphone will be launched soon. Micromax in partnership with MediaTek has also launched a new smartphone ‘Canvas Fire 4G‘ with a MT6735 processor under the hood. We can expect some good mid-range smartphones from Micromax powered by Helio X10 processor.